At Urbanism-TU Delft, we are always trying to understand what are the values that should direct our actions as planners and designers of the built environment. They are not only our personal values. There are societal values embedded in the activity of urban designer and planner. Since we come from all over the world, we must discuss which are the basic values that should guide action. 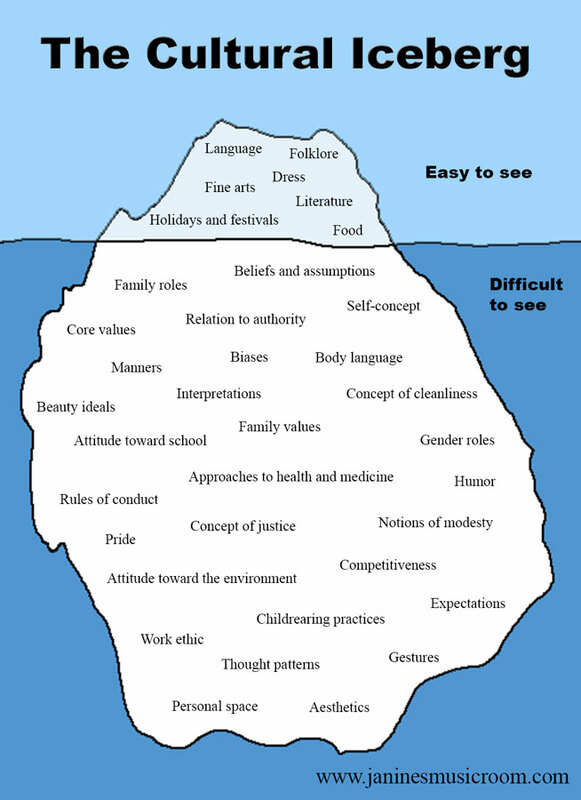 This is an illustration that might help the discussion. The great Italian literary critic, philosopher, novelist, and University of Bologna semiotics professor Umberto Eco died last week. On the surface this event is probably of little consequence to professional urban planners. However, by the end of this essay I hope to make the connection between Eco’s work and urban planning a little clearer. Postscript: A volume of the 2012 Bologna conference proceedings containing some of the papers discussed above was recently published. It is titled Contours of the City: Interdisciplinary Perspectives on the Study of the Urban Space, edited by Fabio Liberto. The book contains a chapter by my University of Denver and Global Cities/Global Citizenship project colleague Roberta Waldbaum entitled “The University and the City: Strengthening Students’ Global Learning”, and another by my York University (Canada) colleague Shelley Hornstein entitled “Demolition City and Modern Madness.” My chapter on “The Urban Imaginary and American Infill: Intercultural Place-Making” is available here. For most students of architecture, the first few years of learning involve a demanding crash course in architectural jargon. From learning terms as obscure as “gestalt” to redefining your understanding of ideas as simple as “space,” learning the architectural lexicon is one of the most mind-bending processes involved in becoming a designer. This challenge is clearly a universal experience as well: when we asked our readers last month to suggest their picks for the “weirdest words that only architects use,” we were inundated with suggestions – including 100 comments on the post itself and over 400 comments on our first Facebook post. Perhaps even more striking, though, was the fact that in all of these comments, there was remarkably little overlap in the words and phrases people were suggesting. The huge variety allowed us to select a list of 150 words – just a fraction of the total suggested. Why Do Architects Use Such Strange Language? First up, to give our list some context we’ll be discussing our readers’ comments about the issues surrounding architectural language – those who are here for the list alone, feel free to scroll down! Bearing in mind the above comments, it’s important to remember that this isn’t a list of words you should immediately stop using; simply be aware of who you’re talking to, and be sure that if you do use any of these words they are necessary and appropriate in the context you use them. I still remember the best lecture I ever attended. It was part of a joint series offered by the English and philosophy departments in my first term at university and, given that the subject was Sartre’s Being and Nothingness, should have been the dullest event in Christendom that night. But it wasn’t. The lecturer, Thomas Baldwin, had a deceptively simple style: he would write a proposition on the blackboard facing us and gaze at it for a moment, like a medium beckoning a spirit. Then he would turn and smile, and start to explain. Baldwin paced the room – but slowly. On occasion he would stop altogether, appearing lost, a moment in which all the world’s logic seemed at stake, before somehow refinding his path to a second thrilling proposition. At one point he stood with his forehead in his hand for so long we almost called for a medic. He was so engaged, so present, that you could almost feel the motion of his mind – and through his, your own. I doubt if fewer words have ever been spoken in the course of an hour-long disquisition, and yet we all tripped to the bar buzzing with excitement afterwards. To this day, if I’m feeling blue I think back to Baldwin’s explication of the logical transition from anguish to nausea, and invariably I feel better. Baldwin’s talk came to mind recently when I listened to a debate, on Radio 4’s Today show, about lecturing standards at British universities. I have two children at uni who have both have found lectures frustrating, so the contention of the education minister Jo Johnson that quality in this area was “highly variable” came as no surprise to me. What’s more, during sample orations on open days, I had the same experience of being bored to tears by things I felt I should have enjoyed. So when my daughter reported an exception to this rule, I knew what my first question would be. “Hm. No, he just spoke,” she said. PowerPoint is so ubiquitous that Lotte hadn’t made the connection. But the lectures I attended had left me in no doubt that Microsoft’s wildly successful “presentation” program is not just inimical to, but destructive of, deep thought, and could have been scientifically designed to put the most eager mind to sleep. The more I inquired into why this might be, the more I began to see its somnolent reflection everywhere. Let’s stay with teaching a moment. PP’s enthusiasts claim that it emboldens nervous speakers and forces everyone to present information in an ordered way. To an extent, both contentions are true. But the price of this is that the speaker dominates the audience absolutely. Where the space around and between points on a blackboard is alive with possibility, the equivalent space on a PP screen is dead. Bullet points enforce a rigidly hierarchical authority, which has not necessarily been earned. One either accepts them in toto, or not at all. And by the time any faulty logic is identified, the screen has been replaced by a new one as the speaker breezes on, safe in the knowledge that yet another waits in the wings. With everyone focused on screens, no one – least of all the speaker – is internalising the argument in a way that tests its strength. So, a few bored students: how serious is this? If the problem ended there, the answer would be, not very. But it doesn’t – and a glance at PowerPoint’s origins helps to explain why. The genesis story runs like this: from the late 1950s corporations began to realise that, rather than going to the trouble of developing new products they hoped would meet a need, they could use marketeers to create the perception of need, then develop products to meet it (a shift brilliantly dramatised in the TV series Mad Men). To do this, different departments had to be able to speak to each other, to sell ideas internally. So while there had always been meetings, now there were meetings about meetings and – hey presto! – the modern world was born. The presentational precursor to PowerPoint was the overhead projector, which is why PP screens are still called “slides”. The program owes most to Whitfield Diffie, one of the time lords of online cryptography, but it was quickly snapped up by Microsoft. Its coding/marketing roots are intrinsic to its cognitive style, being relentlessly linear and encouraging short, affirmative, jargonesque assertions: arguments that are resolved, untroubled by shades of grey. Do we notice that, as the Harvard Business Review has observed, “bullets leave critical relationships unspecified”? No, because thanks to the relatively low resolution of most projectors, fonts must be large, words few, and thus slides many. In the face of such a procession, we switch off, because nothing is being asked of us. As the academic visual-presentation expert and PP sceptic Edward Tufte notes: “PP actively facilitates the making of lightweight presentations.” Through PowerPoint, everything has a tendency to resemble a pitch rather than a discussion: information is “storyboarded”, as for a movie – but the presentation is not a movie and the presenter is rarely Brad Pitt. No wonder we are bored. Perhaps even worse, in the context of the 21st century, is a charge levelled by the French writer Franck Frommer in his book How PowerPoint Makes You Stupid. Because PP can only present propositions and arguments as equations, he says, they appear to have no owner; no one need feel responsible for them. In the post-banking-crisis world, we know both how seductive this is – and how dangerous. Some canny business leaders are now following Steve Jobs’s example, and Tufte’s advice, by restricting PP use to pictures. My friend also told me that when he removed PowerPoint from lecture theatres, his students demanded it back, because without it they had to organise their own notes. In this century, it seems to me, our greatest enemy will not be drones or Isis or perhaps even climate change: it will be convenience. The University of North Carolina Academic Writing Handouts are out! We welcome feedback about these handouts and suggestions for additional handouts. Please email us or call us at (919)962-7710 with your ideas. If you enjoy using our handouts, we appreciate contributions of acknowledgement. Interstellar ‘should be shown in school lessons’: Science, research and creativity go hand in hand. Originally published by the BBC HERE. 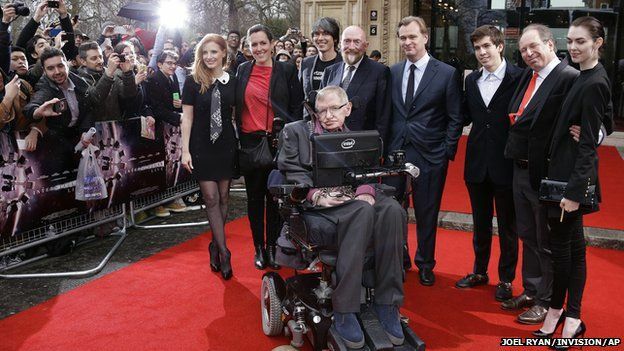 The film Interstellar should be shown in school science lessons, a scientific journal has urged. They say their call follows a new insight gained into black holes as a result of producing the visual effects for the Hollywood film. Experts have also confirmed that the portrayal of “wormholes” is scientifically accurate. Scientific papers have been published in the American Journal of Physics and in Classical and Quantum Gravity. Dr David Jackson, who printed one of the papers in this month’s AJP, said “publishing this paper was a no-brainer”. The director of Interstellar, Christopher Nolan, told BBC News that Dr Jackson’s comments and the two journal publications were “very important” to him. “Right from the beginning we all really believed it’s time to inspire another generation to really look outwards and to look to the stars again. “We hoped that by dramatising science and making it something that could be entertaining for kids we might inspire some of the astronauts of tomorrow – that would be the ultimate goal of the project,” he said. Mr Nolan worked with Kip Thorne, a professor of theoretical physics at the California Institute of Technology (Caltech) who was also one of the film’s executive producers. Prof Thorne’s vision was to produce a sci-fi film with real science woven into the fabric of the story. “Films such as Interstellar or Contact or 2001: A Space Odyssey are inspirations for young people. A number of people I trained as a physicist with got involved with science because of movies like these. So if you are going to have a film that really does attract young people to science it had best be scientifically accurate,” he said. Designers drew on scientific equations when creating their computer-generated effects. 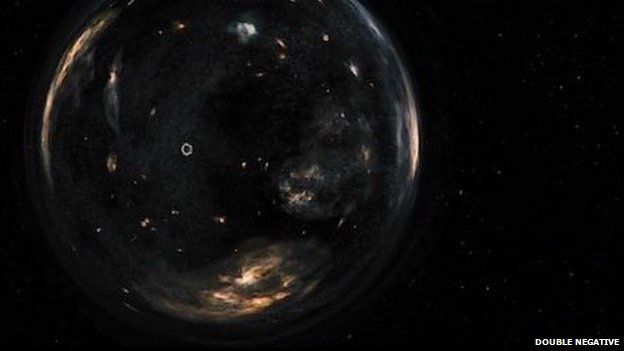 Particular attention went into the representation of the super massive black hole in the film and a wormhole that connects our Solar System to another in a different galaxy. 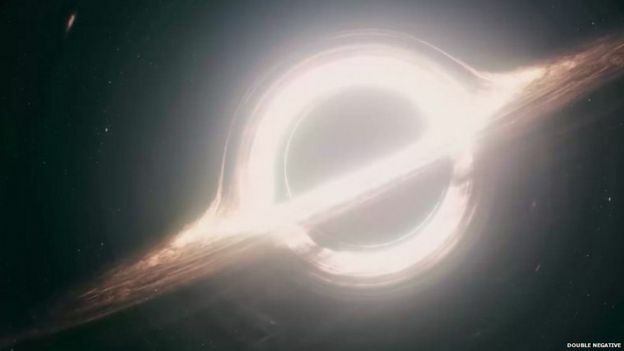 The visual effects company Double Negative developed a new suite of software that enabled them to calculate the way light rays travel across the warped space around the black hole. The software was developed to produce extremely high resolution images suitable for a Hollywood film. The resulting pictures revealed delicate filigree patterns never observed before. These raised new questions that were of sufficient scientific interest that they prompted a publication in the Institute of Physics journal Classical and Quantum Gravity. The wormhole produced in the film is unlike any other seen in Hollywood films. Typically, they are shown as a giant cosmic drain with material falling into them. But by turning to physics the scientists determined that it would look like a crystal ball hanging in space. Inside was a distorted image from the galaxy on the other side. These new discoveries prompted Prof Thorne and the visual effects team at Double Negative to publish two scientific papers. “What was really exciting was that we were able to show the reality of the Universe was stranger than anything we could imagine,” said Paul Franklin, the film’s visual effects supervisor. Christopher Nolan told BBC News that scientific accuracy helped him tell a better story. Mr Nolan told BBC News that he has always been interested in science and was inspired by Carl Sagan’s popular science TV programme Cosmos when he was younger. “I got a lot of fascinating insights into the possibilities of the Universe and so we felt a real responsibility with the film to try to inspire young people in the same way,” he explained. And he added that getting the science wrong in films these days is no longer an option. In general, Hollywood does seem to be getting better at portraying science in its blockbuster films. This may partly be due to an initiative by the US National Academy of Sciences called the Science and Entertainment Exchange. This puts scientists in contact with film-makers and TV producers in order to get more accurate science on the big and small screens. Prof Kip Thorne believes that it has been a successful initiative and recalls how films used to be. “My only pet peeve is the Disney movie, The Black Hole, which was both a bad movie and a bad depiction of the science. I understand Disney is remaking it and presumably this time it will do a far, far better job,” he said. Prof Thorne may have some insight into how attitudes at Disney have shifted because he was giving a talk at the corporation’s studios two weeks ago about the science of Interstellar. “There is a lot of interest from Disney in this movie and the methods we used to get the science right,” he said. “Phenomena – It’s all around us. Phenomenology was pioneered by Edmund Husserl in the early 20th century and studies the “structures of consciousness as experienced from the first-person point of view,” according to the Stanford Encyclopedia of Philosophy. The field has influenced a wide array of critical theorists, including Jean-Paul Sartre and Martin Heidegger. This questionnaire was originally conceived for the project ‘Research into Practice’ of the University of Hertfordshire, led by Professor Michael Biggs and Daniela Buchler. In order to answer this questionnaire, please do so without consulting sources on the Internet. This questionnaire is about what you know now, and about how you deal with research in areas of planning and design practice. Please, grade the sentences bellow following the system: (1) Fully disagree, (2) Slightly disagree, (3) Neither agree nor disagree, (4) Slightly agree, (5) Fully agree. TU Delft has great resources that explain to students the difference between citation, quotation and paraphrasing. Please visit the webpage HERE. Paraphrase if the idea or theory is important, but the exact words less so; cite if the exact words are as important as the ideas expressed. Generally, arts scholars tend to cite, while science scholars paraphrase. Paraphrasing: using your own words to describe someone else’s idea, theory or design. Always refer to the original author’s text and clearly separate the paraphrased text from your own ideas. Always put the text between double quotation marks and refer to the original author’s document. “Water content is an important factor in the acid- and alkaline-catalyzed transesterification of vegetable oil” (Kusdiana and Saka, 2003). Keep your quotes short, too long quotations make your text difficult to read. Quotes substantiate your arguments, but it is your own input. Paraphrasing is often better than quote. 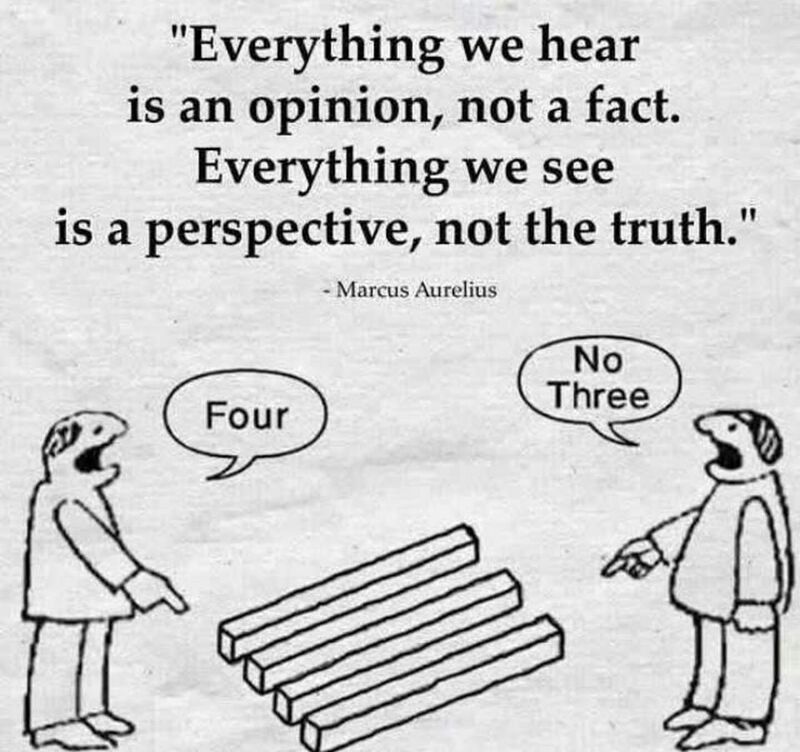 You can view ideas often clearer and shorter in your own words. Scholars almost always paraphrase or cite other people’s work in their papers or scientific articles. At the start of a paper or a scientific article you often have to give an overview of research that has already been carried out before. You need factual (e.g. statistical) data taken from the official source. You want to support your own arguments by using the words or ideas of influential scientists in the field. Sometimes you want to illustrate your point. What is the difference between a reference list and a bibliography? A reference list is a list of documents (books, articles, papers, presentations, e-mails…) that you cite or paraphrase from. You should always add a reference list at the end of your paper if you cite or paraphrase in the text. A bibliography is a list of documents (books, articles, papers, presentations, e-mails…) that you have consulted during your research whether or not you cite or paraphrase from. A bibliography contains all references from the reference list. When is using someone else’s work plagiarism? Plagiarism is using someone else’s work or findings without indicating that you have done this. This is also valid for pictures and photographs etc. that you use to illustrate your arguments. Without a reference to the original author’s work, you give the impression that the ideas are your own. This is not allowed, and may result in your expulsion from university. There is an exception: if knowledge is deemed common knowledge – in other words, something which everyone in a particular field knows – you do not need to refer to an original author. However, in this case it is a good idea to be cautious: if you are not sure, it is better to include a reference. There are many different citation styles, with their own formatting rules and their own order for the literature in the reference list or bibliography. Two important groups are the parenthesised styles and the numbered styles. Parenthesised styles use an abbreviation of the full references immediately following the citation or paraphrase in the text (typically, the author’s name and date of publication; page numbers may be included), with a full reference in the reference list at the end of the paper. The reference list is usually ordered alphabetically according to first author’s surname. A litre of water is required to produce every calorie of food (International Water Management Institute, 2006). International Water Management Institute, 2006. Comprehensive Assessment of Water Management in Agriculture. Numbered styles use a number immediately following the citation or paraphrase in the text (either in superscript or between square brackets), with a full reference in the reference list at the end of the paper. The reference list is numbered sequentially, which means that the references occur in the same order in which they occur in the text. A litre of water is required to produce every calorie of food . Comprehensive Assessment of Water Management in Agriculture (International Water Management Institute, 2006). Different subject areas favour different citation styles. Some popular styles are Harvard, APA, Chicago and Numbered Style. Ask your teacher which style to use. If you are publishing, check the publisher’s ‘instruction for authors’. Otherwise, simply choose the style you like best, but be consistent. Source:TUDelft (2015). “How to Cite.” Retrieved 20 February, 2015, from http://tulib.tudelft.nl/publishing/how-to-cite/.